Join us on Valentine’s Day for a special couple’s menu, British pub Style! Our special evening starts with a glass of bubbly for each of you and a prix fix menu with our delicious chef created dinner. * St. Venison’s Pie: Venison from Nicky Farms in Aurora, Oregon sautéed in a red wine reduction and then simmered with locally sourced produce including red onions, tomato, juicy carrots and fresh herbs and spices. Please note that you can also choose any pie from our menu such as a Steak and Ale or Vegetable Pie. Join us for a lovely evening with your love! Please call the pub on 971-254-9518 or email Niki to reserve a table. Looking for holiday fun for the whole family? Join the Portland Panto Players for their unique take on The Wizard of Oz and enjoy the traditional English holiday event of panto theater. Panto, short for pantomime (although there is no miming involved! 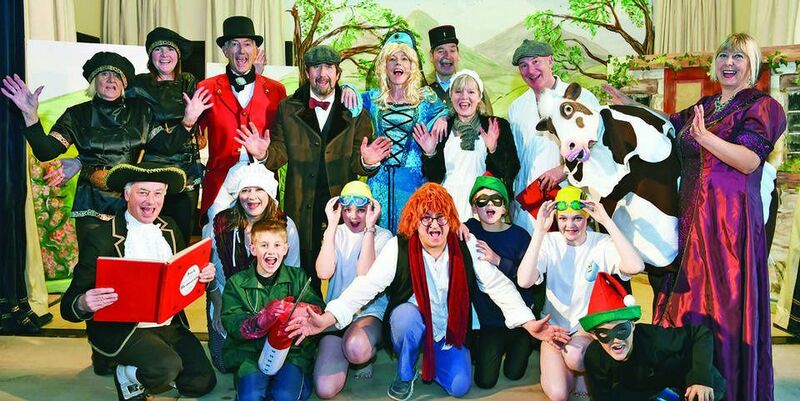 ), is an English holiday theater tradition that involves comedy, slapstick and audience participation. Panto spins gender roles. Some female characters are always played by a man - specifically the "dame", and sometimes a woman takes on the role of a man - the "principal boy". The audience is invited to enjoy actors retelling a well known story, such as The Wizard of Oz with a distinctive panto spin. The Toffee Club blog sat down with Portland Panto Theater co-founder Jane Clark for more information on this lively theater experience. What is Panto and why do you think people in Portland will find it interesting? Jane: Panto is a boisterous, family-friendly theater event filled with slapstick, witty dialogue and a few wink-wink jokes for the adults. It’s an old holiday tradition in England, but is something new and exciting to Portland. Most importantly it is a form of theater that can be enjoyed by all ages - from the kids to the grandparents. It’s traditionally only performed in England around Christmas time, so it translates well to the festive season in Portland. Does this have anything to do with Shakespeare and the fact that men played all the roles? No - but every panto had in it a "dame" - an outrageous and funny character who is always played by a man, dressed as a woman. Monty Python for example dressed up as women, but this is not traditionally Panto as it doesn’t involve a full play. Where are you and Portland Panto Theater co-founder Art from and what brought you to Portland? I’m originally from England. I moved to the USA 25 years ago. While in England, I was very involved in community theater and did a lot of Children's Theater. I moved to Portland 16 years ago after my son, Noah was born. Art was born and raised in Detroit. He worked for a short period of time in professional theater when he was young and during the course of his career has directed many documentary film projects. We are both very committed to supporting local theater and regularly attend shows in Portland. What foods are associated with Panto theater in England? Although there is no food directly associated with going to the panto, our traditional English foods during the time of a panto are mince pies, Christmas cake and christmas pudding. We are excited to work with the Toffee Club for a special offer. Bring in your panto ticket after the performance and receive a complimentary homemade traditional mince pie! Yes for sure - lots of cheering for the heroes, booing for the villain, shouting instructions to the characters on stage such as 'It's behind you!" and maybe joining in the chorus of a couple of songs. It’s s the audience participation that makes a panto so much fun and different to many other forms of theater. Are the actors in The Wizard of Oz local or are there more British actors in the group? It’s a mix. I’m playing the wicked witch. My son, Noah, who is half British is playing the scarecrow with a British accent. My daughter, Madeleine is playing Toto and my mom and stepdad are coming over for Christmas and will be the hosts introducing the show and explaining to the audience what a panto is all about. The rest of the cast are local actors - so we have a good mix. I hope you can join us for The Wizard of Oz. It truly is a memorable family event. Thanks to Jane Clark and the whole Portland Panto team. It sounds like a truly different theater experience for the theater loving Portland crowd. We love sharing the English culture in Portland, Oregon. We hope you will stop by the Toffee Club after the performance and taste our mince pies! Click here to visit the Portland Panto Players website for tickets to this magical holiday event! British Ex-pat looking for a fun group of people with common interests? Join the Brits in Portland Meetup Group and attend the Panto together on December 30th.